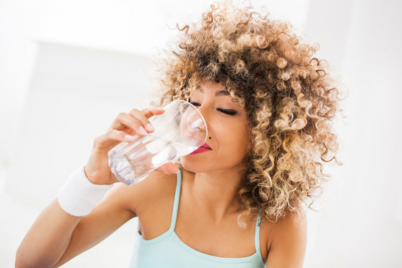 As the New Year approaches, you might already be thinking about your health-focused resolutions, as those holiday indulgences start to become all too real come January. An easy way to start eating healthier and slashing sugar? Cut back on carbohydrates. While it may be tempting to sign up for a trendy plan like the Whole30 to stay on track, there’s no need to do that if you’re just looking to make a few low-key lifestyle changes. Instead, just add a few high-protein, low-carbohydrate foods to your grocery cart. Now, you’ll still need to make sure you’re eating enough calories each day, so be mindful of which foods you’re putting on your plate and how you’re pacing your meals and snacks. (After all, your body needs fuel to make it through those HIIT classes.) For a lower-carb diet, try and split your food groups like this: 30 percent protein, 30 percent fat, and 40 percent carbs. “For a 2,000 calorie diet, that equals 200 grams of carbs per day, and for a 1,500 calorie diet, around 150 grams,” says Lauren Harris-Pincus, R.D.N and author of The Protein-Packed Breakfast Club. “I consider a balanced meal, like lunch or dinner, to contain about 45 grams of carbs, and for snacks to be around 15 to 30 grams of carbs and three to 10 grams of protein, depending on the calorie level you are looking to achieve. A sample 500-calorie meal comes out to 37 grams protein, 50 grams carbs, and 17 grams fat,” she says. And, remember that even non-starchy veggies contain carbs, with about five grams per one cup raw or half-cup cooked serving, she adds. Plus, choosing the right types of carbs is key. “If going low carb is important to you, make sure to use your carb grams wisely and pack in plenty of fruit, vegetables, whole grains, nuts, seeds, beans, and low-fat dairy,” she says. Go easy on refined carbohydrates like bread, crackers, chips, and baked goods, as they are high in sugar and lack in fiber. “Agave, maple syrup, honey, coconut sugar, etc. are all sugars,” she says. There’s approximately four grams of sugar per teaspoon regardless of the variety, she explains. Here’s her trick: “Fill half your plate with non-starchy veggies, a fourth with lean protein, and a fourth with whole grains or beans with healthy fats, like avocado, nuts, seeds, or hummus. Add a few fruit servings per day and some low-fat dairy products, and your diet will be appropriately balanced and lower in carbs than the typical American diet,” she says. 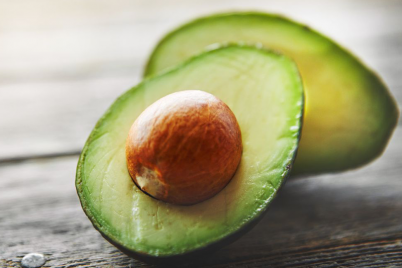 So, what are these high-protein, low carbohydrate foods you’ll want to stock up on? Dietitians share their top choices with us. “Black beans boast some of the same antioxidants that give blueberries their superfood status. They pack an amazing 15 grams of fiber per cup (60 percent of the daily recommended value), and provide a source of vegetarian iron and plant protein, as well as a modest amount of calcium,” says Maggie Moon, R.D.N. and author of The MIND Diet. There are 15 grams of protein and 41 grams of carbs per one cup cooked, she says. String cheese and Mini Babybel are Harris-Pincus’ go-to snacks. “Mini Babybel offers 100 percent real-cheese snacks in a convenient and fun little package. One creamy cheese round provides at least four grams of protein and zero grams of carbs for 70 calories or less,” she says. Meanwhile, per the USDA, one stick of low-fat string cheese has about six grams of protein and one gram of carbohydrates. “Pistachios make an excellent snack with 30 nuts providing only 100 calories and five grams of carbs for a satisfying snack that won’t break the calorie or carb bank,” says Harris-Pincus. 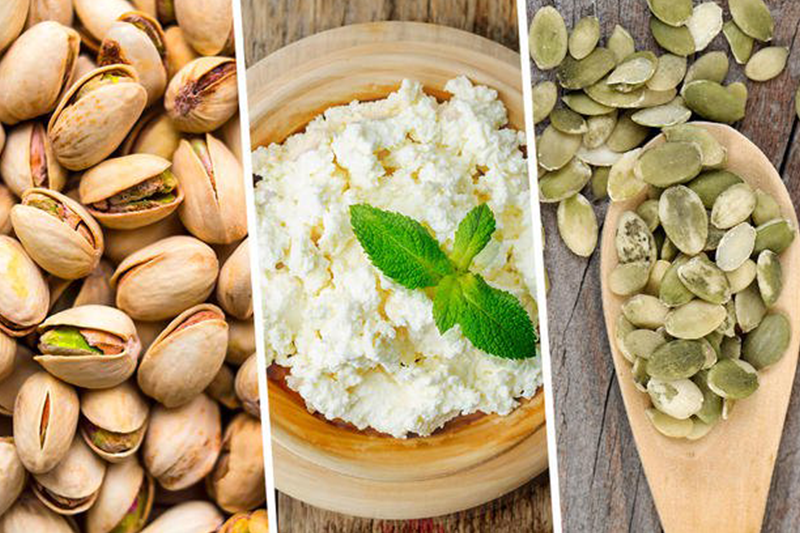 Plus, pistachios are high in protein, with three grams per 30 nuts. It’s also a satisfying snack that can help aid weight-loss efforts. “Fish is a brain-healthy lean protein, and fatty fish in particular helps you get the essential omega-3 fatty acids that are important for healthy arteries, reducing inflammation, and keeping the brain healthy,” says Moon. Try Arctic char, a cold-water fish related to salmon, which is similarly pink and boasts omega-3s, she suggests. “Arctic char is a good source of potassium, and tastes like a cross between salmon and trout. Plus, all Arctic char is considered a ‘best choice’ for sustainability by the Monterey Bay Aquarium’s Seafood Watch,” says Moon. In general, a four-ounce serving of fish will clock in at 20 grams of protein and no carbs. There are many lower-sugar Greek yogurts on the market now, some with just a touch of sugar and others sweetened with Stevia or monkfruit to keep the carb content down without use of artificial sweeteners, says Harris-Pincus. “On average these yogurts range from 90 to 120 calories with 12 to 15 grams of protein, 11 to 15 grams of carbs, and some with higher fiber counts as well. Look for varieties containing nine grams of sugar or less, and add in nuts or berries for added fiber,” she says.